Spring arrives today in about 9 hours from the time I’m typing this post – However, the clouds in East Windsor right now sure don’t match our date on the calendar. We may get another frosting of snow today – let’s hope it is the last for the season. It is chilly and gloomy, so I thought I’d share just a few snapshots from my visit to the Elizabeth Park Conservancy (located at the corner of Prospect Avenue and Asylum Avenue on the Hartford-West Hartford Line) to cheer you up as you deal with today’s weather. I attended the show yesterday. Fortunately, the sky was blue, the sun was shining, and the warmth of the greenhouse was a refreshing change from the cold temps still lingering outdoors. (Address for GPS: 1561 Asylum Avenue, West Hartford, CT). The first thing I noticed was the smell of Hyacinth, which looks similar to the purple Muscari shown in the photo above but is much bigger – and everyone knows of them – Hyacinth bulbous flowering plants are very popular during Easter. They have an intense strong scent so it is no wonder the blooms of many filled my nose the minute I opened the door to the greenhouse at Elizabeth Park. I arrived at 9:45 am figuring it would be best for parking. Taking 91S to 84W, and the exit for Asylum Street, turn right, go straight for about 1.5 miles, and the park entrance is on your left. First thing I saw was a big fallen tree on the ground which fell over from the force of the 40-60 mph winds the day before. It was near the entrance area. A tree working crew was just showing up to clean that up. Proceeding down the lane to the greenhouses, I planned to park adjacent to a nice cafe, called the Pond House, they have at the site – but the parking spaces were already full. This really surprised me, so I exited and took a right, circled back, and re-entered the park again. By this time, the tree crew moved to another part of the road and they were all looking up at a limb hanging above. Because the road is one-way, I parked on the roadside near the rose garden beds and took a brisk walk to the greenhouses. I really didn’t mind the walk because it was blue skies and very sunny. Others were walking the park for exercise too. 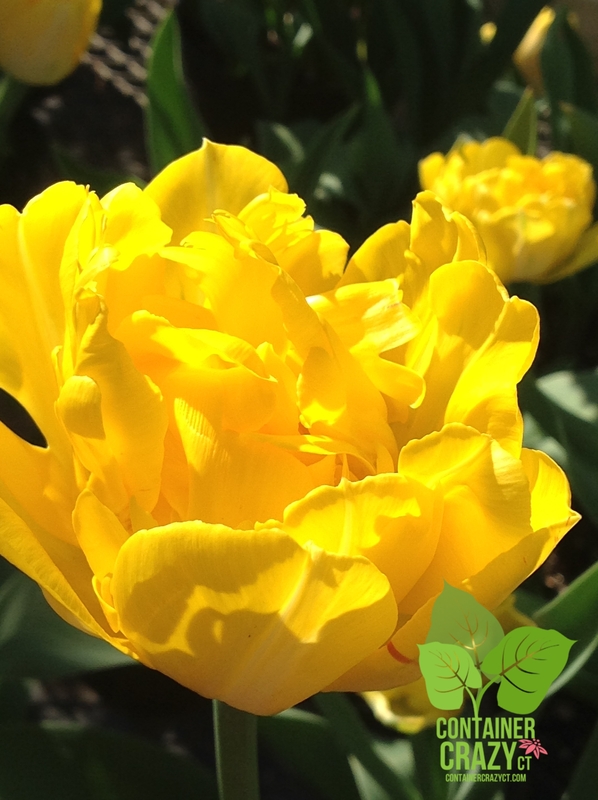 I absolutely adore yellow roses and tulips – and I enjoy taking close up shots of flowers. So, with my handy iPad, I started to lean in to take shots. 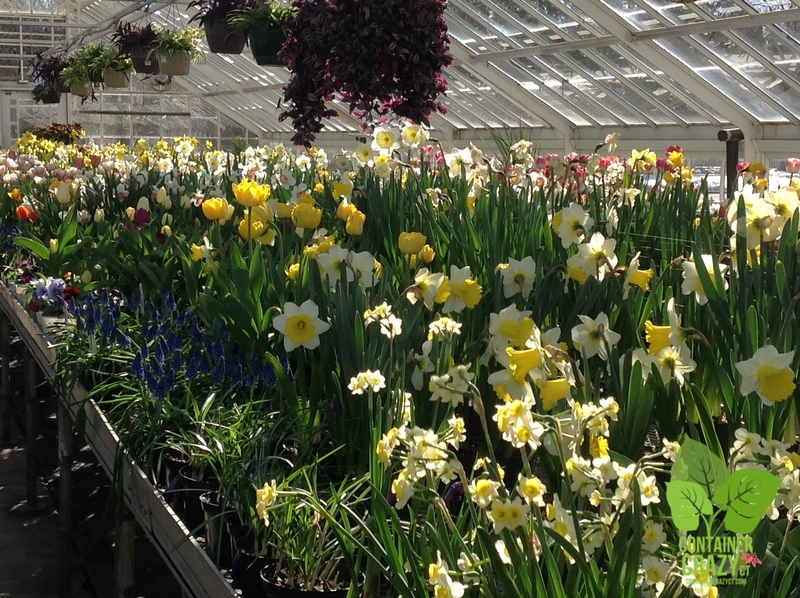 The greenhouse was quiet – only 4 other people were inside chatting and admiring the plants. I found out later the crowded parking lot was due to seminars and classes being held in the cafe. Fascinated by the internal structures of flowers, I leaned closer to a beautiful Amaryllis flower to take photos. Many are blooming in the greenhouse. 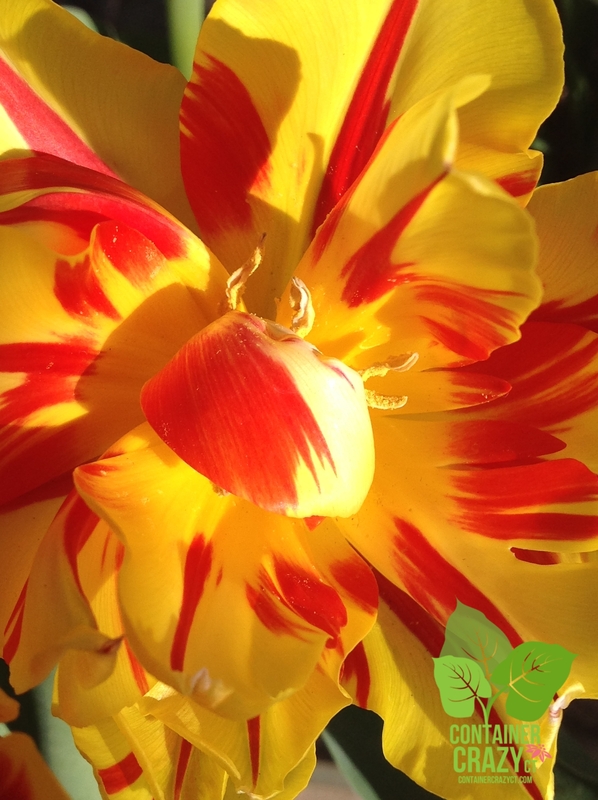 I love how the sun placed shadows of the stamen and pistil parts of the flower on the petals. To know those tiny pollen molecules move from the anthers of the stamen to the stigma female portion is incredible. So many things happen in plants, if only we could zoom in closer or see the insides operating. Anyhow! 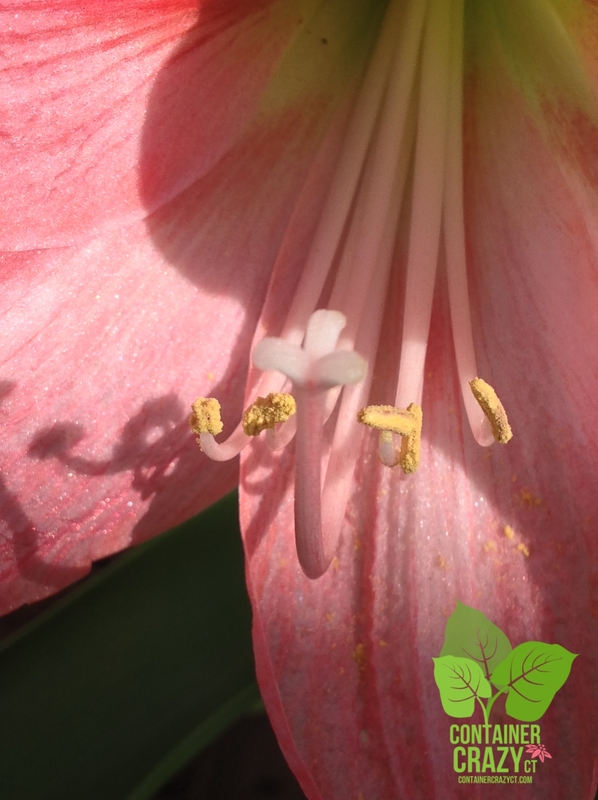 The pink flower petals of the Amaryllis were sparkling in the sun which was truly glorious on a sunny bright winter’s day in their greenhouse. I was fortunate and happy I took the time to visit. Visiting the greenhouse early in the morning hours was a good call. The sun was shining through and hitting the blooms everywhere. 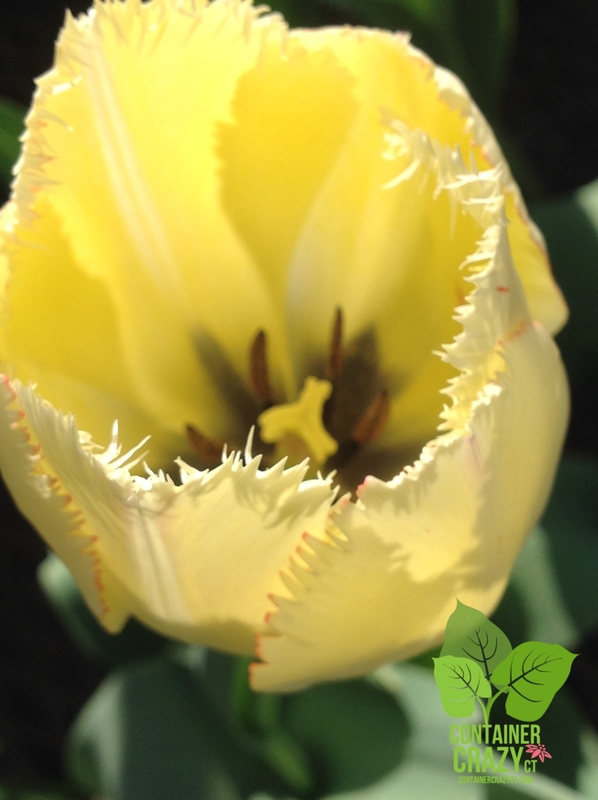 This tulip has frilly edges to its flower petals – making it all the more elegant in soft yellow. 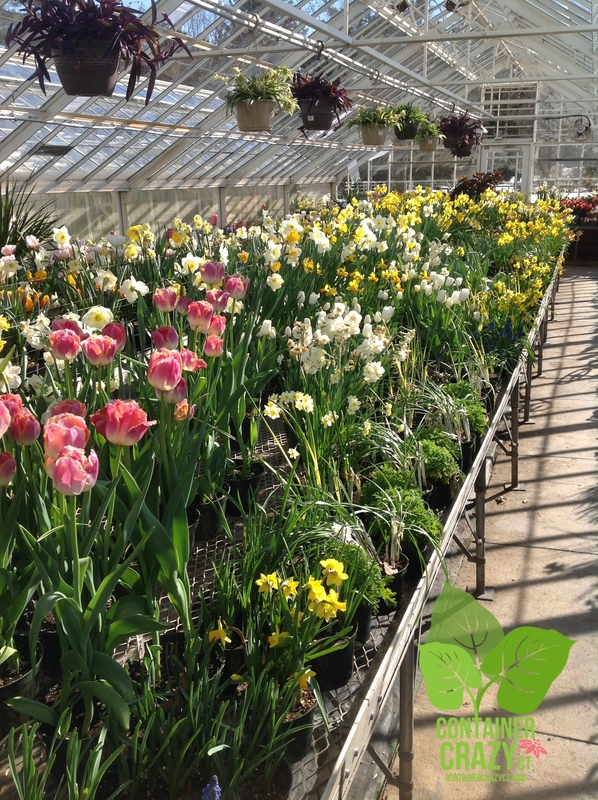 This Spring Greenhouse Show at Elizabeth Park runs from March 14th to March 27th, 10:00 am to 5:00 pm daily. 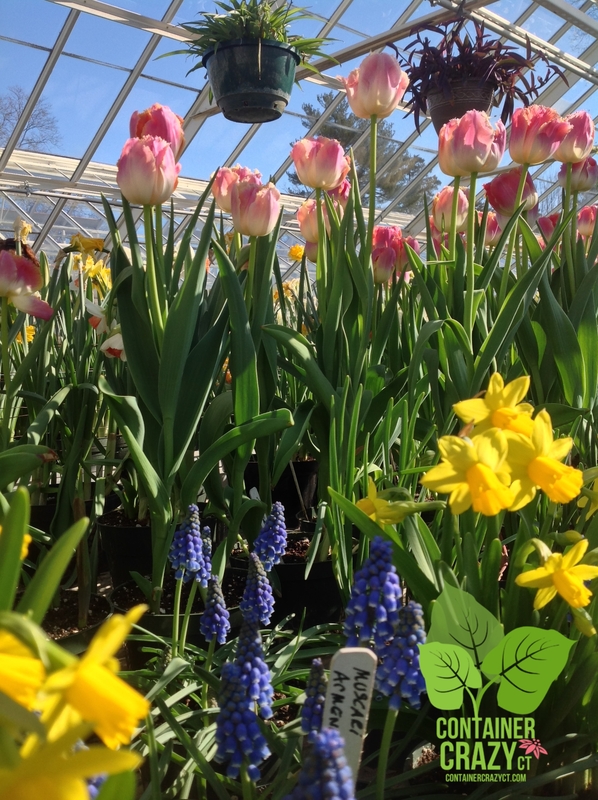 The various spring bulbs will definitely cheer you up if you decide to go. As I snapped away, one of the workers came inside to tend to plants, so I took the opportunity to ask him how the greenhouse is heated. The structures here are ancient and historic – In fact, Elizabeth Park is on the national register of historic places. There are three greenhouses on the property – only one is part of the showcase at this time. The worker was very kind and told me it is heated by large pipes which run directly under the benches, which of course, I didn’t notice or see because the benches are fully covered with flowers and plants. The temperature in the greenhouse was 60 degrees during the time of my visit, and he told me at night they keep it between 45-50, and the sun is what rose the temp to 60 at that time. I surely was enjoying it! If you are a photographer, there are plenty of photo-opps here! One of the visitors in the greenhouse was a pro – he had this big tube which he held up at the end of his camera lens, and he didn’t take long to capture his photos. I was sure to not interrupt him – taking pictures of plants is a form of therapy while you go from one to the other in a old beautiful greenhouse when the sun is shining. The only thing you hear are the six fans circulating away at the top of the structure and some mumbles of plant admirers in the greenhouse. These photos are beautiful!!! I keep meaning to get to Elizabeth Park, but haven’t made it just yet. Can’t wait now! How refreshing to see some thriving plant life!